A reminder that nominations for the 2020 Canterbury, Cambridge and Oxford Fellowships and Grants are now open. Nominations for visits to UC (fellowships) and visits by UC academics (grants) are due into the Erskine Programme Office by 10 May 2019. Visits will take place during 2020. All Schools and Departments can apply for a Cambridge and Oxford Fellowship or Grant. If you have any questions, please contact the Erskine Programme Office at erskine@canterbury.ac.nz. Professor Tammy Allen has joined us from the University of South Florida, located in Tampa, Florida. My general background is in industrial and organizational psychology. My research and teaching focus has been on work-family issues, worker career development, and occupational health. My first experience as an Erskine visitor was in 2012 and I have been interested in returning since then. I appreciate the collegiality of the psychology department and the concern that is shown for students. My current host, Katharina Naswall who I met during my first visit, shares an interest in worker wellbeing and we are currently collaborating on a large-scale cross-national work-family project. Every time I visit a university, I learn something new, which I try to take back to my home institution. My primary activity has been teaching a course on Stress, Health, and Wellbeing to the Applied Psychology graduate students. I am co-teaching with my partner, Mark Poteet, who is also an industrial-organizational psychologist who does consulting work. While I focus on theory and research, Mark focuses on application within the workplace. The students have been eager to learn and their engagement has made teaching the course very rewarding. I also delivered a research lecture focused on work-family conflict. In the lecture I discussed a program of research my lab has been conducting in which we investigate the day-to-day conflicts that individuals experiences between their work and family roles, decision-making about competing work-family demands, and physiological reactions. It has been delight to return to Christchurch and see the revitalization of campus life and the city that has occurred since 2012. I have also very much enjoyed interactions and sharing of ideas with students and colleagues within psychology. 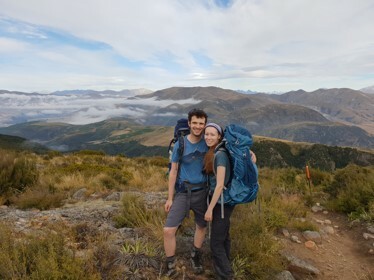 My partner and I enjoy outdoor activities and have been fortunate to do some great hiking while here, including the Tongariro Crossing on the North Island, Abel Tasman, and trails in Mount Cook Village. We continue to be stunned by the natural beauty of New Zealand. We love the warmth and friendliness of the Kiwi culture. I’m grateful to have had this time at UC! The Erskine Programme is pleased to announce that nominations for the 2020 Canterbury, Cambridge and Oxford Fellowships and Grants are now open. Please contact the Erskine Programme Office at erskine@canterbury.ac.nz if you have any questions. Dr Thomas Bennett is visiting UC from Cambridge University and will be teaching in the School of Physical and Chemical Sciences | Te Kura Matū. Where have you come from, and what do you teach? I am a Royal Society University Research Fellow, based in the Department of Materials Science and Metallurgy, in the University of Cambridge where I lead a group of around 10 PhD students and Post-Doctoral Researchers. metallic (used for surgical instruments and golf clubs). The group discovered a 4th category, which incorporates elements and molecules from across the periodic table, and much of our research concentrates possible applications in next generation display technologies, protective coatings and communications equipment. A second strand involves looking at the fundamental synthesis, properties and applications of porous materials. These materials can be thought of as tiny ‘sponges’ or ‘sieves’ capable of separating and storing greenhouse gas molecules such as CO2, radioactive substances or drug molecules. They find applications as H2 storage tanks for H2 in cars, as additives in fruit packaging which prevent over-ripening, and as water harvesting devices for desert locations. I am always keen to expand my international experience, and to learn from different institutions in order to transport knowledge on best practice back to the University of Cambridge and to my group there. I am particularly keen on utilising research skills from across the world to solve truly global problems, and Aotearoa New Zealand in general has a rich history in innovation in fundamental science. UC has an exchange scheme with Cambridge, hosted by Prof. Paul Kruger, I am really grateful for the opportunity to come here. I have just started a lecture course on porous materials, and am particularly excited about being able to factor in latest research in the area. The quality of both undergraduate and graduate students is high, and I am looking forward to working with them to produce an academic review of an unexplored area of the field, which we will aim to publish in an international scientific journal. Outside of the 15 hours of the week spent holding face-to-face and group meetings with members of my fantastic team back In the UK, I’ve met numerous students in the broad area of physical sciences here, and discussed some fascinating research taking place. My door is always open and I’m enjoying not only teaching, but also learning from students. What have you most enjoyed about your time here at UC/Ōtautahi Christchurch? 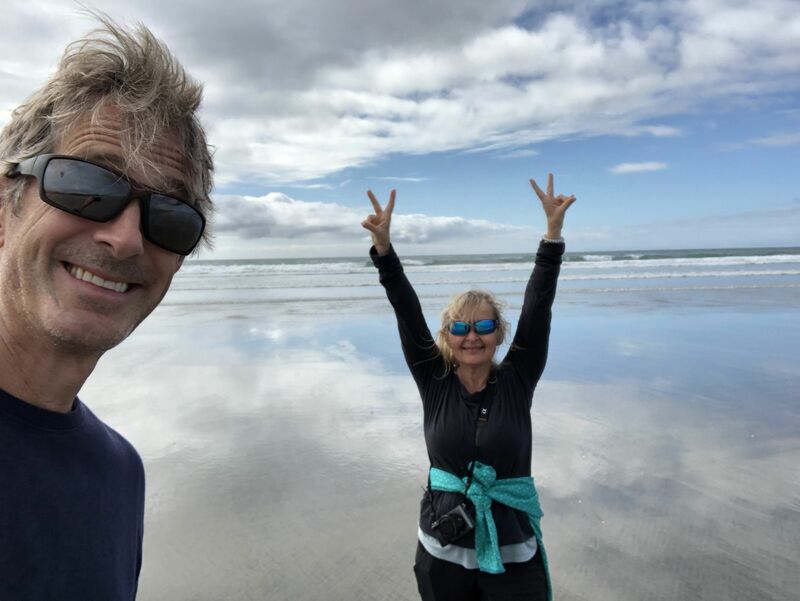 Outside of academia, I am an extremely keen tramper – most weekends you will find my partner, Helena and I walking on a mountainside, wading in a river, or in backcountry hut with a packet of squiggles, playing cards and meeting other trampers! I’ve been to Aotearoa New Zealand several times before, though personal favourites this time around have been the Greenstone Caples track, Salisbury Lodge in the Kahurangi and the Mount Somers circuit. Evidently, working and living in Ōtautahi Christchurch is very different to spending a few weeks in the backcountry, and I am really enjoying learning much more about Kiwi culture whilst here. Professor Gary Libecap from the University of California, USA will be teaching in the Department of Economics and Finance. Professor Bodo Rosenhahn from Leibniz University of Hannover, Germany will be teaching in the Department of Computer Science and Software Engineering. Professor Michael Delichatsios from the University of Ulster, UK will be teaching in the Department of Civil and Natural Resources Engineering. We hope our new and returning visitors to UC, and their families, enjoy their visit.